At wits end . . . . Okay, back on June 21st the wife and I took the Wing to Denver Co from our home in OkCity Ok. The route was straight forward , I-35 to I-70 to Denver. Should be no issues, right ? We where pulling our trailer, and fought a fair head wind, but a over all nice day for a ride, or so we thought. Just shy of Wichita Ks, the bike lost power on me, trying to shut down. I squeezed the clutch in, reved the motor, it sputtered and then reved fine and away we went. 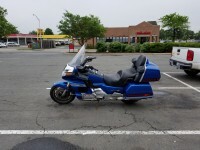 I stopped and got fuel there in Wichita, got back on the highway and headed for the next stop, Salina Ks. 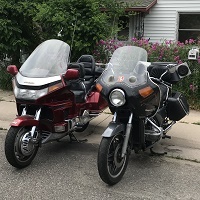 As we approached Salina, the bike did it again, only this time the motor did shut off, but fired right up when I let the clutch out, so again, off we went. Again, stopped for fuel, got back on the highway and headed for Colby Ks. 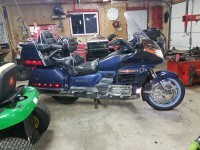 About 30 miles shy of Colby, the bike again shut down, but this time would not restart, so we pulled off on to the shoulder, I checked a few items, took seat off, tested for fuel by pulling the fuel line at the pump and hitting the starter button, strong fuel shot. While seat was off, felt around for anything excessively how, none found, so I called my GWRRA tow plan and arranged a tow. About 15 min before the tow got there, I tried to start it again, just to see, and it fired right off and went to a smooth idle. As it was now about 10 pm and the tow driver had already confirmed being on his way, I decided to let him tow us in to Colby where we spent the night. 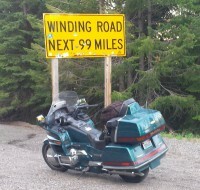 The next morning, the bike started fine, so we fueled up and headed for Denver. We got about 30 miles down the road, about 10 miles shy of Goodland Ks, when the bike then shut down for good. We sat on the side of the highway for two hours, no tow available because we used it the day before. Finally two riders stopped to check on us, we could not figure it out either, so they towed us via strap into Goodland and I was able to call a Club Brother with a truck and trailer to rescue us. The bike has not restarted sense then. I talked to a friend and trusted mechanic here in Okc, he thought maybe the Bank Angle Sensor went bad, he has a good running GL1500, so he took his B.A.S off his bike, I plugged it in to my bike, no go. I even tried my B.A.S on his bike, still started right up, so it APPEARS that is not it, now he is suggesting the CDI might be bad, what are the thoughts here on that ? Any other ideas what to look at/for? Re: At wits end . . . . Even tho you you had good fuel at the seat,it may not be making it to the carbs. My first suspect is the vacuum fuel valve/vacuum line feeding it. The problem sounds fuel related to me based on your description. The fuel valve would be the best place to start. The fuel pump is also still possible if it is intermittent. Definitely check those connections. I did check the fuel pump connections again after I got it home, wires all appear good, I also replaced the fuel filter as it was old and dirty (and cheap !) and so far still won’t start. I have not checked spark yet as it has been hellish hot here and I do not have a garage or covered area to take the body apart and work on it. I will take that next step this weekend though if nothing else works. Did you try just loosening fuel filler cap. Vent can get blocked leading fuel pump to pump until it can't overcome vacuum … fuel flow stops. Yep, had that issue before, was first on the list of to check, sorry I forgot to mention it before now. Some times it is the simplest stupid things that cause the biggest issues. 1) I would check fuel petcock, or just by pass it and see if it starts and problem is gone. 2) Check the kill switch or the screw connections to the kill switch. 3) Connect fuel pump in a closed loop feeding fuel back into the tank, so that you can run it for an extended period of time to check for any, or intermittent operation. Power directly off of an auto battery. Bike battery isn't big enough. That is all I can think of as well. Fuel Petcock being the number one suspect. Hate to rail on this point, but the smoke came from somewhere, most likely the wires. Some digging and disassembly will likely be required. If not the wires, then an electrical component. The fuel filter for example would not have caused smoke to come from the bike. He did not mention any smoke. Did you get the smoke angle from a different thread? Woops, wrong thread. Teach me to post before I've had my coffee. Please disregard. This was meant for my thread it seems. I wish the OP luck, I know the feeling bro! Following along here also. This looks fairly similar to what I just went through. A week of no riding to find the issue was a 5 min repair of the kill switch wires! Mine had come loose, then I find the kill switch is worn out, so I hot wired the 2 wires together. Ignition is now all done by the key. Have you opened and checked your kill switch? Worth looking into for sure! I am out with the wife for a late supper right now, but will check the kill switch when I get home tonight or first thing in the AM as that is a easy check. just curious...did you check the kill switch after? That’s a thought . . . . . Okay, cooled off some here, so I tested the kill switch, as far as in the RUN position it cranks like it is supposed to, in the OFF position, it does not crank. Is that enough of a test ? If not, how do I go deeper ? Next, how do I test the side stand switch ? Is this a '96 you are working on? I thought it was not until '98 that the kill switch would prevent starting with the switch in the OFF position. Maybe I'm mistaken. Yes, a 96 Aspencade. 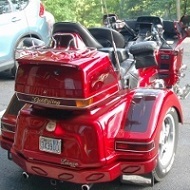 It has always, sense I got it, not cranked in the OFF position, so I assumed that was normal for the ‘Wing. . . . ? When I had my 96 it would act in a similar fashion sometimes. The 1500 will keep feeding fuel while the tank is 1/2 or above via gravity - after that the next 1/2 of the tank needs the fuel pump assist. The fuel pump test requires you are able to pump fuel 3 feet above the tank filler at a specified volume over specific time. Thanks for that, it was hot and tank low two of the times, full-ish, 50 miles driven at 20 mpg due to winds that trip , the third time, and I do need to check battery level after all the attempts to start it with no luck.